Read more to find out about Dr. 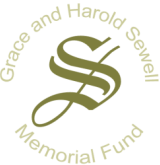 Win Sewell's motivation for establishing the Grace and Harold Sewell Memorial Fund. Motivation - A personal history of sixty years of medical librarianship is provided by Win Sewell. Beginning with the manufacture of penicillin, Win supplies anecdotes of her interactions with clients up to the advent of genomics. The stories explain her motivation for providing stipends for attendance of librarians or other information specialists at the national meetings of their clients. In addition, she describes her life experiences that ultimately led to the formation and implementation of Learning Partnerships. Family History - Dr. Winifred Sewell (b. 1917 - d. 2002) established the Grace and Harold Sewell Memorial Fund in 2001. In her own words, "The fund is to be named the Grace and Harold Sewell Memorial Fund in honor of my parents...."